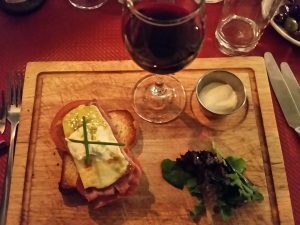 It was with some excitement that we decided on dinner and to review Frédéric Bistro in Maidstone one recent evening, to sample what we hoped would be delicious traditional French bistro cuisine. This little place has got quite a name for itself, so much so that we had to book a month in advance to obtain a Friday night reservation! Now that’s what I call a good recommendation! It’s a simple yet vibrant little restaurant in the centre of Maidstone, just off Earl Street. If you didn’t know it was there you could very well miss it, as we have obviously done on several occasions in the past. Situated down a small alley, Frédéric looks so very inviting from the outside as we stand in the cold night air! So in we go to warm up and are immediately greeted by truly friendly and welcoming faces! We are offered a choice of tables for two on the far side of the room, and as we make our way to be seated there are just a couple of tables already eating, though as the night progresses the restaurant becomes full and bubbles with energy from what I’d say is not your regular Maidstone crowd! As I look around the room I am guessing that these are people who are more adventurous with the food they eat, that they are those who truly enjoy good food, as opposed to those who just eat for eating’s sake! 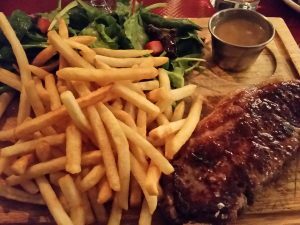 The menu offers a wonderful variety of dishes – both starters and main courses – with the latter being labelled ‘Bistro Classics’ – and that they are, with the likes of Lamb Cassoulet and Bouillabaisse to whet your appetite! And though we rarely think of the French as being vegetarian, there are several delicious looking dishes with ‘vege-quarians’ (seafood) in mind, which include a mouth-watering looking (and smelling Ratatouille) Tortilla (one for next time), and Butternut Squash & Mushroom Risotto! Frederic’s have a carefully selected wine list of which we choose the St. Julien – Les Fiefs de Lagrange 2010. A beautiful wine that’s on the pricier side of those offered but well worth the extra few £s. Smooth and rich in flavour with a hint of cherry and blackcurrant, the perfect accompaniment to our dinner menu. I order the Pâté de Foie Gras – something truly traditional from a French Bistro. As with many other dishes served in the restaurant, this is presented on a wooden platter – it’s a fabulous choice, smooth and creamy with rich flavours that are enhanced by a glass of Monbazillac. Frédéric Bistro Chef and Patron Ulric comes over to enquire how our starters are and asks if I’d be interested in sampling the Pan Fried Foie Gras! I immediately accept and within minutes Ulric reappears with tasty looking, delicately pan-fried Foie Gras atop a slice of toast. 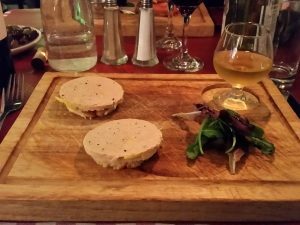 A stronger flavour than the pâté, with an interesting texture – extremely delicate and soft – I enjoyed it and would definitely try again. My dinner date selects the Proscuitto & Brie Melt which looks divine as its brought to the table with warm Brie dribbling down over the Proscuitto, Tomato and Brioche… there’s nothing not to enjoy about this tasty, sumptuous appetiser! It’s Beef Bourguignon for me, and Sirloin Steak for my date. Wow, Wow, Wow… Let’s start with the Sirloin steak. Presentation if wonderful, planked steak with thick French fries, salad and peppercorn sauce. The steak is tender to cut and succulent with a delicious flavour. Chef Ulric certainly knows how to cook the perfect steak, and those French Fries dipped in a little ketchup…well, you just can’t beat it! Beef Bourguignon comes to the table piping hot, served with a selection of beautifully cooked veggies, still with a bite to them – Yum! The Bourguignon sauce is full of flavour with delicious pieces of mushroom and lardons to add even more delight to the taste buds. Fresh bread, though not made on the premises, finishes off this exquisite, traditional French dish. Hard to believe that after all of the above deliciousness there would be room for dessert, but how could one not be tempted by Homemade Apple Tarte Normande, and Homemade Lemon & Lavender Roulade? The desserts and cakes at Frederic Bistro are all creations of Ulric’s wife, Sarah Allesbrook. I’m not a big dessert eater but the Lemon & Lavender Roulade is exquisite. The lemon lights up your mouth then the beautiful flavour of lavender follows through. It’s full of flavour yet so light that you won’t feel like you’ve overloaded by having all three courses. 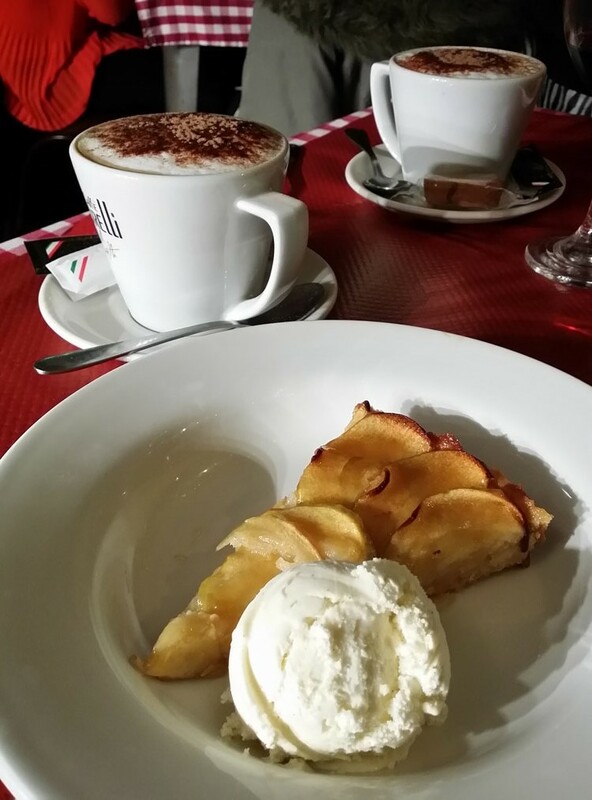 Apple Tart, well, it’s Apple Tart – who doesn’t love it, no matter where it’s made – my partner tells me this one goes a little further on the taste buds! 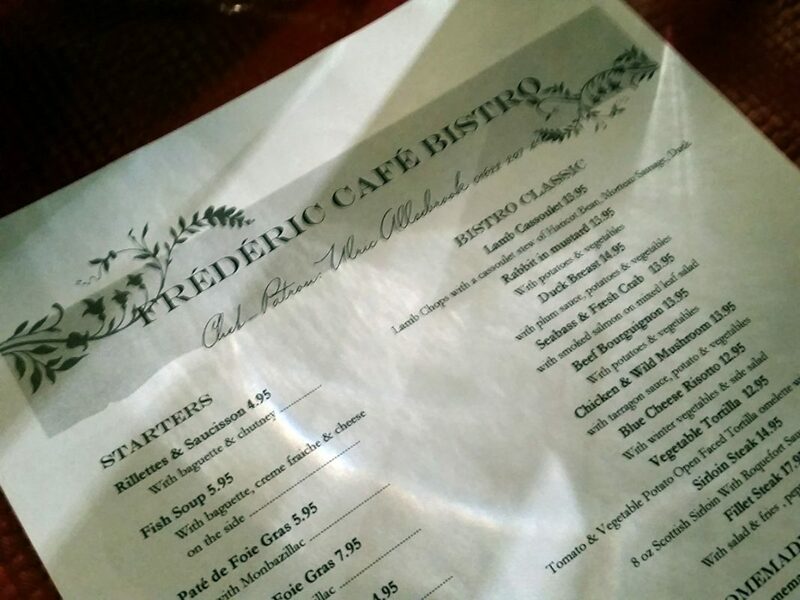 So we give Frédéric Bistro a big thumbs up. 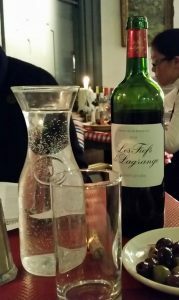 From the warm welcome and helpful staff to the fabulous chef who wants to make sure you have the best experience possible, as well as a wonderful wine list and selection of delicious tasting, authentic French dishes – it’s everything you’d expect and more at the wonderful little French Bistro in Kent. Enjoy and let us know how you enjoyed your visit! 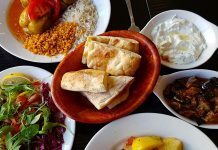 It’s a simple yet vibrant little restaurant in the centre of Maidstone, with a small but rather very good menu.